Rebel Creamery has five new flavors of high-fat ice cream with no added sugars. With more and more people opting to follow low carb diets, there's been an explosion of sweet treats that claim to be healthier than their sugar-filled originals. Now, a new ice cream that's marketing itself as ketogenic-diet friendly is rolling out this month — and the company behind it says it's the first premium, low-carb, high-fat, no-sugar-added product that's commercially available. Rebel Creamery first launched its Kickstarter in November. Since then, over 1,400 people pledged $80,400 to bring the product to market. According to Google Trends, searches related to the keto diet have more than quadrupled over the past year. 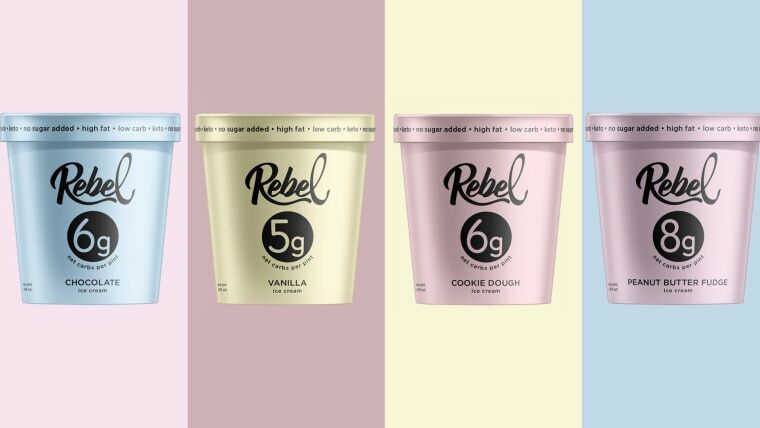 But is Rebel's new dessert actually healthy and does it taste like real ice cream? If you're new to keto, let us bring you up to speed: The ketogenic diet calls for a day's worth of calories to consist of 60 to 80 percent fats, 15 to 35 percent proteins — and very, very few carbs, usually around 5 percent or less. It's not new, either. Doctors developed it in the 1920s to help treat epilepsy patients, but plenty of celebrity fans have helped bring the diet back into focus recently. With so few carbs coming in, the body goes into a state of ketosis and starts to rely on body fat as fuel. "The pros of the keto diet are that if you follow it correctly, you are generally eating whole, unprocessed foods and barely any sugar. I do think that the keto plan can be an effective way for healthy people to lose weight, but it’s not for everyone and it’s definitely a challenge to follow," said Frances Largeman-Roth, RDN, author of "Eating in Color." But it's not a one-size-fits-all plan. "[The ketogenic diet] also restricts fruit consumption," added Largeman-Roth, "which is why I would never advise any of my clients to follow the diet long term. They would be missing out on too many disease-fighting antioxidants." Rebel Creamery co-founders, Austin and Courtney Archibald, said they initially tried the diet as an experiment to reduce sugar intake and eat more healthily. "We felt so great that we decided to stick with it," Austin told TODAY Food. One thing they missed, though, was ice cream: "Homemade ice cream was a staple in our house and a favorite family activity. Rather than giving it up, we decided to 'ketofy' our favorite recipes at home since existing commercial options were higher carb, contained sugar and had an icy or chalky texture," he said. After running experiments at home and consulting food scientists, the couple also made sure the ice cream passed the "kid test." Austin said his kids loved it, by the way. So how does it compare to typical ice cream? A half-cup serving of Rebel Creamery has 150 to 200 calories, 14 grams of fat, 2 to 3 grams of protein, 0 grams of sugar and 10 to 14 grams of carbohydrates, depending on the flavor. Premium ice cream ranges from about 140 to 250 calories, 9 to 18 grams of fat, 1 to 3 grams of protein, 15 to 25 grams of sugar and 15 to 28 grams of carbohydrates per half-cup serving. Most flavors of Halo Top, arguably one of the most popular lower-sugar, high-protein ice creams on the market, contain 80 calories, 2 to 3 grams of fat, 5 grams of protein, 6 grams of sugar and 14 to 16 grams of carbohydrates per half-cup serving. Rebel Creamery flavors are sweetened with monk fruit and erythritol (which is also found in Halo Top) instead of sugar. But according to Largeman-Roth, erythritol, a sugar alcohol popular among paleo followers "can spell digestive woes for lots of people, especially those with IBS," she said, adding, "If you’re going to eat this ice cream, make sure to stick to one serving." It also contains cream, chicory root fiber, low-carb stabilizers and egg yolks — which not only boost the ice cream's fat content but also creates a slower-melting product. But what does it really taste like? As with other low-carb ice creams, it's best to let Rebel soften for 10 or 15 minutes on the counter before serving it since the lack of sugar makes it rock-hard in the freezer. If you're not a fan of Halo Top's slightly grainy, icy finish, Rebel's creamier, custard-like ice cream may be right up your alley. But the high fat content left our mouths with a moderately slick, slightly oily coating — as if we had eaten a spoonful of butter. Peanut Butter Fudge was the overall favorite, especially among lovers of the nutty spread and tasted the most like real ice cream in terms of taste and texture. Cookie Dough and Mint Chip were also strong contenders and tasted very similar to their full-sugar counterparts. At 8 and 7 grams of net carbs per pint respectively, Peanut Butter Fudge and Cookie Dough also have more carbs than the other flavors. Rebel's take on vanilla has a slight marshmallow flavor (a big plus or minus depending on your taste buds) but that flavor, along with the chocolate, was the least creamy of the bunch. But for strict adherents to the keto diet, there's good news: Largeman-Roth confirmed that the nutritional profile of the ice cream fits in with the recommended daily allowances of fats and carbs on the plan — provided you stick to the right serving size. Rebel Creamery, which is now available online, retails for $5.99 a pint. Though the ice cream was initially supposed to be in stores in June, select grocers are now carrying the ice cream, like Lassen's Natural Foods & Vitamins in Southern California. In September, the ice cream will be available at Central Market in Texas and Harmons Grocery in Utah. Soon after, Starmarket and Shaw's in New England, and ShopRite in New Jersey, New York, Connecticut, Pennsylvania, Maryland, and Delaware, will start carrying the pints, according to the company. "Launch has gone way better than expected," Austin told TODAY Food. "We've been swamped with orders and now I need to schedule an emergency production run next week."